Unlike any time before in our lives, we have access to vast amounts of free information. With the right tools, we can start to make sense of all this data to see patterns and trends that would otherwise be invisible to us. By transforming numbers into graphical shapes, we allow readers to understand the stories those numbers hide. In this practical introduction to understanding and using information graphics, you'll learn how to use data visualizations as tools to see beyond lists of numbers and variables and achieve new insights into the complex world around us. Regardless of the kind of data you're working with-business, science, politics, sports, or even your own personal finances-this book will show you how to use statistical charts, maps, and explanation diagrams to spot the stories in the data and learn new things from it. You'll also get to peek into the creative process of some of the world's most talented designers and visual journalists, including Conde Nast Traveler's John Grimwade, National Geographic Magazine's Fernando Baptista, The New York Times' Steve Duenes, The Washington Post's Hannah Fairfield, Hans Rosling of the Gapminder Foundation, Stanford's Geoff McGhee, and European superstars Moritz Stefaner, Jan Willem Tulp, Stefanie Posavec, and Gregor Aisch. The book also includes a DVD-ROM containing over 90 minutes of video lessons that expand on core concepts explained within the book and includes even more inspirational information graphics from the world's leading designers. In this introductory video course on information graphics, Alberto Cairo goes into greater detail with even more visual examples of how to create effective information graphics that function as practical tools for aiding perception. You'll learn how to: incorporate basic design principles in your visualizations, create simple interfaces for interactive graphics, and choose the appropriate type of graphic forms for your data. Cairo also deconstructs successful information graphics from The New York Times and National Geographic magazine with sketches and images not shown in the book. "If graphic designer Nigel Holmes and data visualizer Edward Tufte had a child, his name would be Alberto Cairo. In The Functional Art, accomplished graphics journalist Cairo injects the chaotic world of infographics with a mature, thoughtful, and scientifically grounded perspective that it sorely needs. With extraordinary grace and clarity, Cairo seamlessly unites infographic form and function in a design philosophy that should endure for generations." "This book is long overdue. Whether you're just getting started visualizing information or have been doing it all your life, whether you're looking for a basic understanding of visualization or a detailed how-to reference, this is the book you're looking for. Alberto Cairo, a professional journalist, information designer, and artist, shows how to visualize anything in a simple, straightforward, and intelligent way." "The Functional Art is brilliant, didactic, and entertaining. I own dozens of books on visual information, but Cairo's is already on the shortlist of five that I recommend-along with those by Edward Tufte, Nigel Holmes, and Richard Saul Wurman-to anybody who wishes to have a career in information graphics. Cairo is one of those rare professionals who has been able to combine real-world experience with the academia." "Read It. There is really nothing else to say. If you care about how visualization is used to communicate to people, this is the book for you. If you're a journalist, you need to read it. If you're an academic doing visualization research, you really, really need to read it. This is the stuff we've been missing in visualization for the last 25 years." 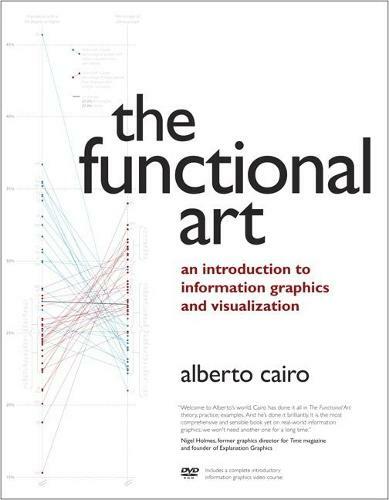 "If you're interested to find the right balance between aesthetics and function in the context of data visualization, you cannot avoid Alberto Cairo's The Functional Art, probably the best data visualization book published in 2012."